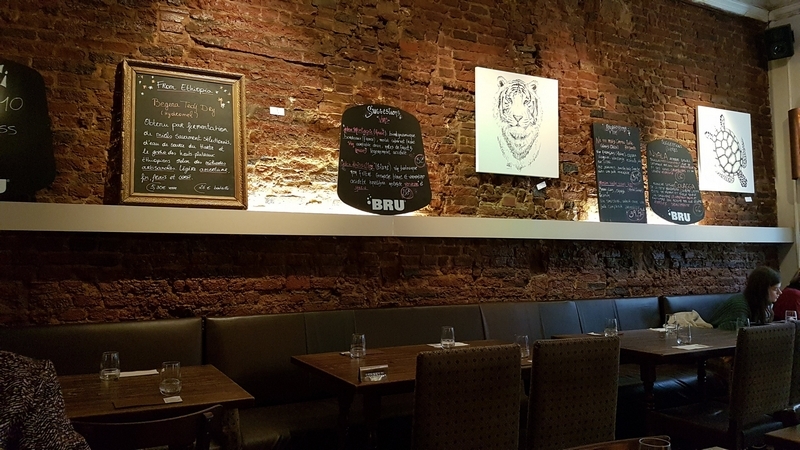 restaurant review #217- Kokob is an Ethiopian restaurant in the city center of Brussels. 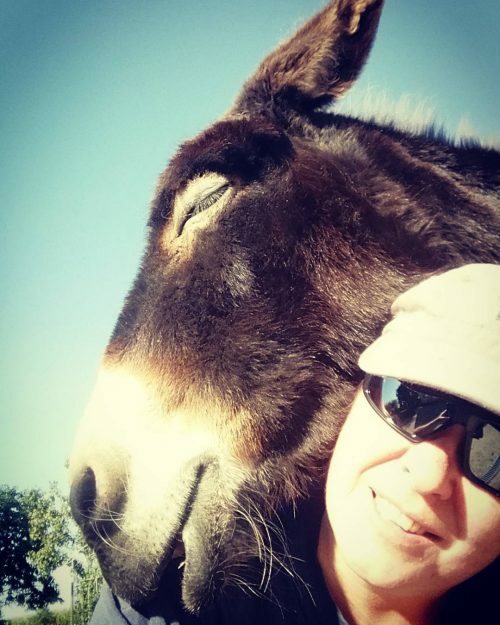 I have seen it mentioned on social media several times over the years, as a place where vegans are welcome. We were here for lunch on a Sunday, and were greeted warmly. 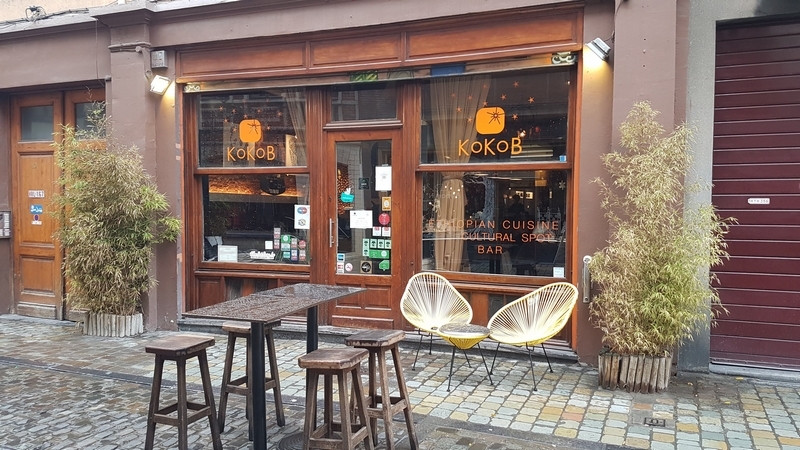 Kokob has a very cosy interior. 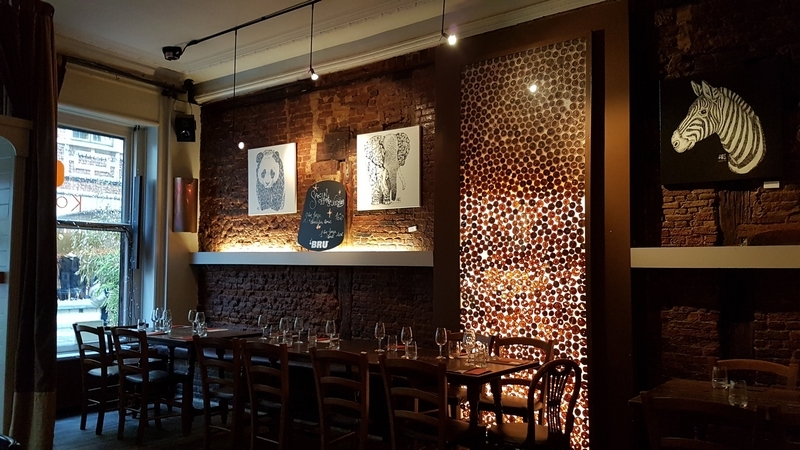 I loved the artwork on the wall, which was from ARI Graphic art. Chairs were rather uncomfortable though. 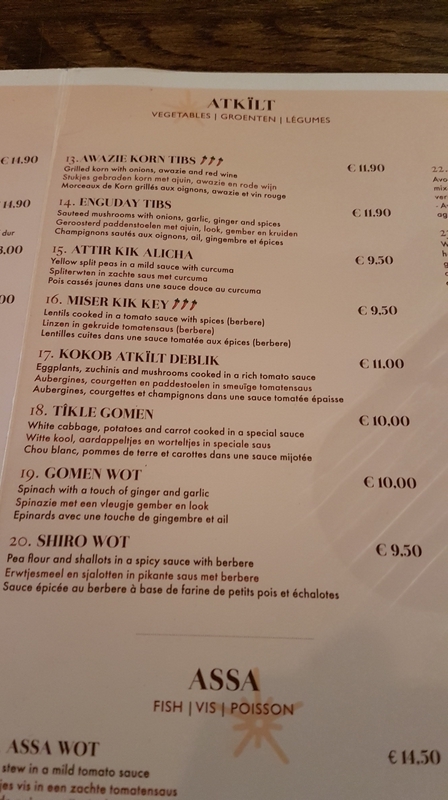 There are several vegetarian dishes mentioned seperatedly on the menu. We specified that we wanted vegan (no dairy, no eggs, etc) and that was said to be no problem. The waiter sounded very reassuring. 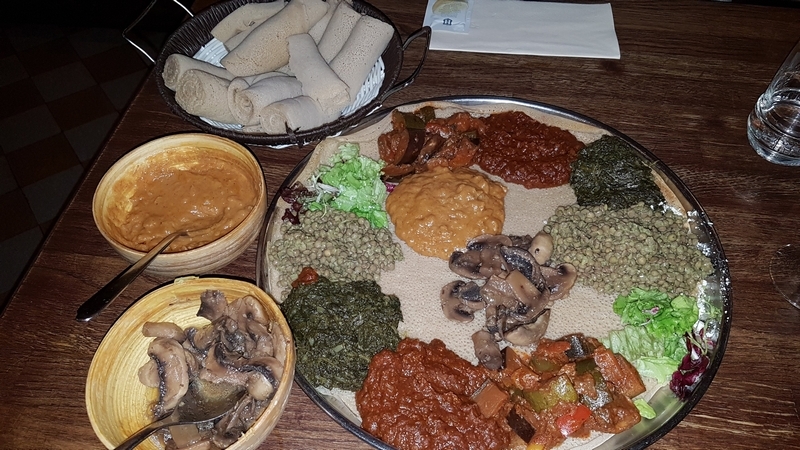 The waiter suggested a mixed platter, with a selection of 6 dishes, at 26€ per person, and this is what we had. 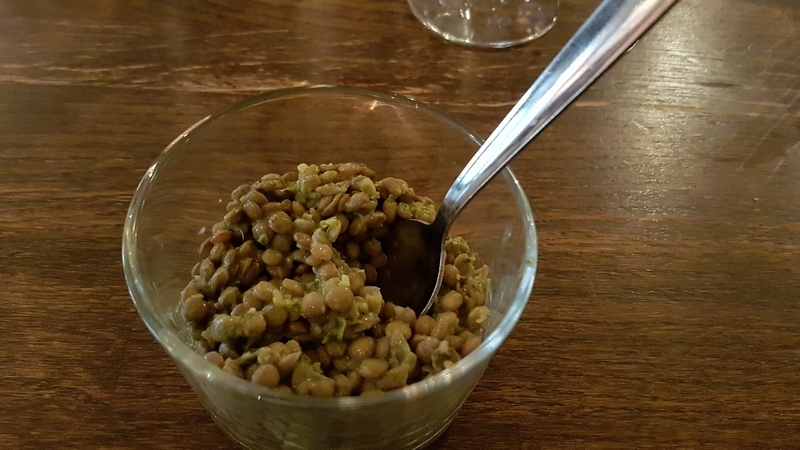 We were served a small appetizer with lentils as an amuse gueule. To me, this tasted a bit monotone. Soon afterwards, our main dish was about to be served. As the waiter wanted to put the large plate on our table, he noticed it was not all vegan (with cheese – apparently the kitchen had taken the order for one vegan and one vegetarian). He returned with the plate to the kitchen. After a couple of minutes, he came back and served our platter. He explained how to eat the food with your hands (scoop up with a piece of pancake) and that we should offer the first scoop to each other. We were already into halfway the dish, and then noticed pieces of cheese around and underneath a scoop of lentils on one side of the platter (I can now see on the photo that it was probably already noticeable from the beginning, but it was rather dark in the restaurant, so we hadn’t seen untill well into the dish). 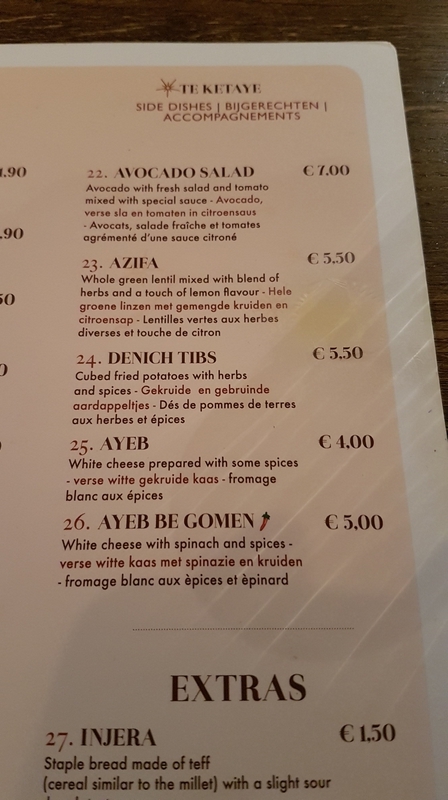 We mentioned when the waiter came. The staff apologised, and offered warm drinks to make up (which we declined, wanted to catch the train back home). 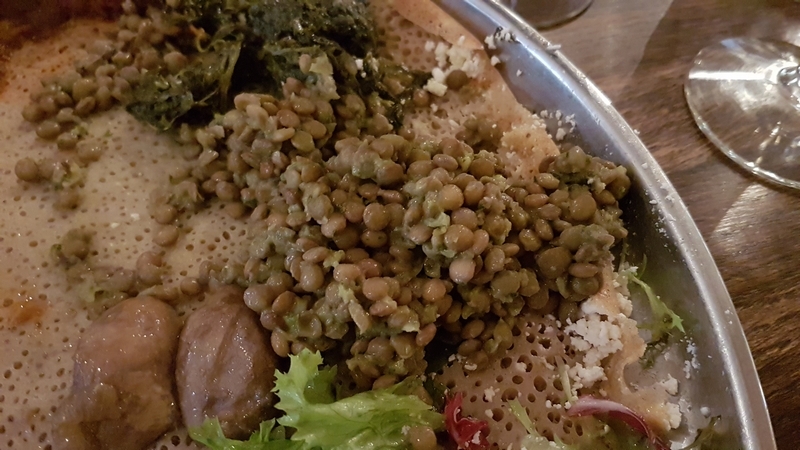 I guess the kitchen staff just wiped the cheese of the pancake – not very thorough though – and replaced it with lentils. The food was otherwise lovely, but this was very careless, and could be really dangerous for people with allergies. Accessibility: there’s one step to get in. 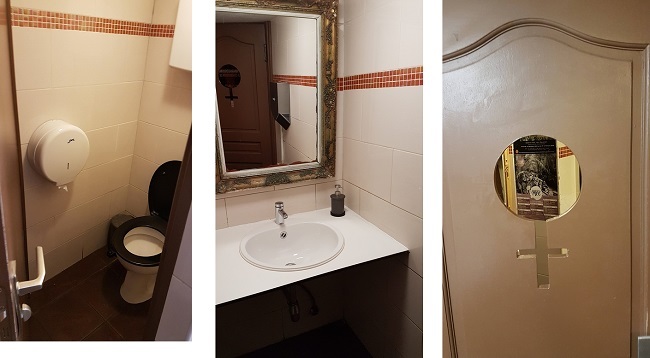 Toilets are downstairs (steep stairs), didn’t see an accessible toilet. Toilets were ok.
All in all: Nice place, nice food, friendly service. But the cheese incident was a real bummer. The food looks really interesting! Will definitely try it out if i do travel there! Thanks for the info! Next PostThe House of Meat. What would you do?